A Chick-Fil-A Customer Was Shocked To See This Guy Still Working… But The Reason Why Will Leave You Speechless! Share the post "A Chick-Fil-A Customer Was Shocked To See This Guy Still Working… But The Reason Why Will Leave You Speechless!" 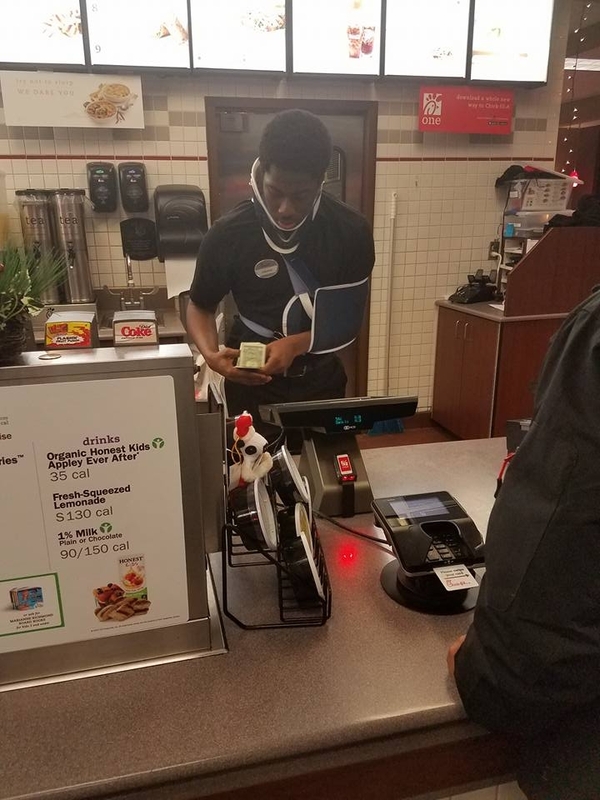 Cameron Nelson stopped by a Chick-fil-A in Indiana recently when he noticed that the cashier, Jakeem Tyler, was in a neck brace and sling. Nelson decided to ask Tyler why he was working when he was obviously still injured. Nelson then took to Facebook to share the young man’s response. Nelson’s post has been shared over 25,000 times, he also started a GoFundMe campaign, aiming to raise $2,500 so that Tyler can afford his plan of feeding the homeless. So far, the campaign has raised $41,500. Nelson told WTKR that he shared the post because he was inspired by Tyler. Tyler’s parents said he’s been saving for the good deed for months.